This is Quinlan Morrow at Dr. Randol’s office drilling out an old extracted tooth to perform a root canal and then a filling. Looking into a mouth that’s undergoing deep cleaning due to periodontal disease is no problem for Quinlan Morrow. Blood and bacteria don’t faze the 17-year-old Roseburg High School senior. “I’m not squeamish at all. I’ve always liked the weird things, the gross things. I loved dissecting sheep brains in biology,” Quinlan said. That’s an asset for Quinlan as she explores career ideas through Area Health Education Center of Southwest Oregon. Not that a strong stomach is a requirement for the many fields presented for students to consider. Still, Quinlan’s fearless attitude means she’s able to jump into just about any situation she encounters as an AHEC intern and member of the Bright Works Oregon Healthcare Team. After getting involved in workshops and meetings last summer, Quinlan started visiting health care clinics and offices in the fall as one of four students enrolled in the “immersion” portion of Bright Works. These visits are designed to immerse students in the daily routines of various occupations so they can evaluate the jobs as potential career tracks. 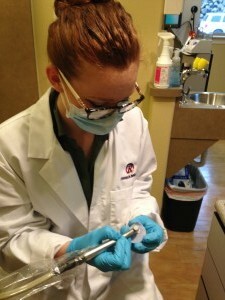 Quinlan’s first internships each took place in Roseburg – one at the dental practice of Dr. Alanson Randol, where she observed fillings and cleanings, and the other at Mercy Institute of Rehabilitation. Much of Quinlan’s time at the latter site was spent job shadowing physical and occupational therapists. She was able to observe procedures such as exercises for a shoulder injury and electrical stimulation applied via a small “gun” to another patient’s nerve-damaged leg. Joe Falls, outpatient rehabilitation supervisor at the Mercy Institute, said while all the interns who have spent time there have been “great,” Quinlan stood out for her bright mind and proactive manner. As part of their program activities, Quinlan and other Bright Works students are refining the details on a project designed to promote physical activity and good nutrition among local families. She’s also doing job shadows at Douglas County Fire District No. 2 and Mercy Imaging. The workings of the human body have always intrigued Quinlan. She said that even before high school, she took every science course she could. In high school, an advanced placement biology course was her favorite. Ultimately, Quinlan hopes to take that fascination into a surgical career. She’d like to be a pediatric surgeon, possibly specializing in oncology. Until then, she says her AHEC internships and Bright Works connect her with others who are just as enthusiastic about health care, including the parts that aren’t for the faint-hearted. 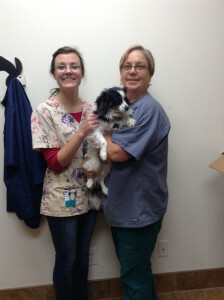 Glendale student Synthany Woodley is an AHEC intern at the Countryside Veterinary Clinic in Canyonville. Many careers, like surgeon, require a four-year or higher college degree. Other health-related careers require an associates or other certificates. AHEC aims to help students explore all aspects of health care and allied health care career pathways. Some of those pathways aren’t necessarily in the human health care field, either. Read Glendale High School senior Synthany Woodley’s blog about her experiences as an AHEC intern shadowing veterinarian technicians and a veterinarian at Countryside Veterinary Service in Canyonville HERE. Learn more about the Bright Works program, which is supported in part by a mini-grant from the Umpqua Valley STEAM Hub, a DCPSS initiative.